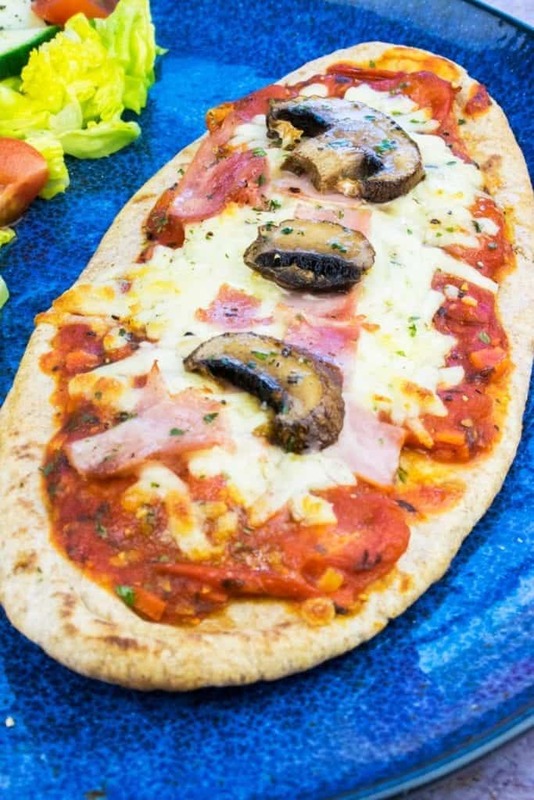 This super simple recipe for Syn Free Ham & Mushroom Pitta Pizza is healthy, filling and nutritious lunch or dinner dish that everyone will love. 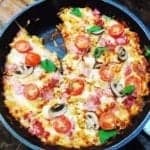 There is nothing that I love more than a Slimming World friendly pizza recipe! It probably has something to do with the fact that I’m a total pizza addict and it has long been one of my biggest weight gain downfalls. 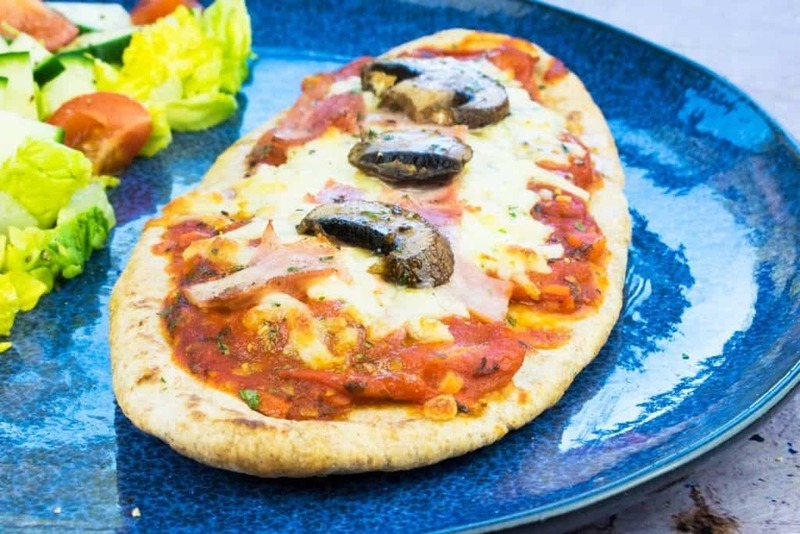 Since starting Slimming World I have developed a number of tasty syn free pizza recipes and this Syn Free Pitta Pizza recipe, topped with ham and mushrooms, is the latest success I’ve had. 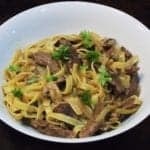 This recipe, as the name suggests, is totally syn free on Slimming World, using one of your Healthy Extra options and your Healthy Extra B choice for the day. 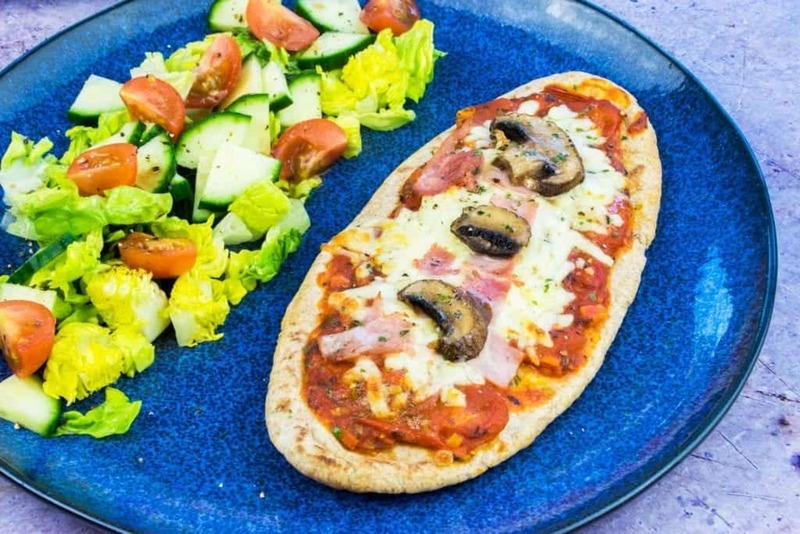 Recent changes to the Slimming World plan make wholemeal pitta bread a great choice for your HexB (standard 60g size) and it turns out that pitta bread makes an excellent pizza base. Who knew?!? 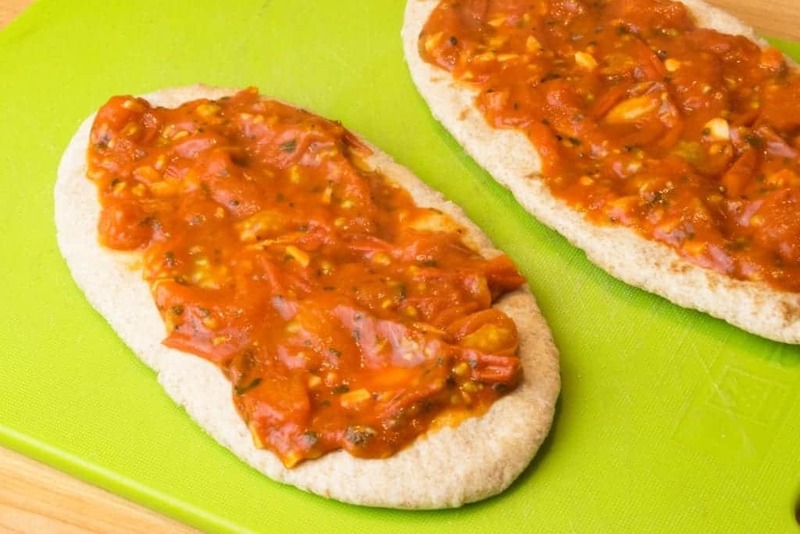 This recipe for syn free pitta pizza is a cut above the rest, partly because of the homemade pizza sauce it’s topped with. 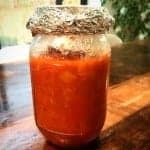 Whilst you could opt to simply use a packet sauce, or even a tablespoon or two of tomato puree on its own, neither will give you the taste explosion that you’ll get from spending five minutes making the one I’ve included in the recipe below… trust me! 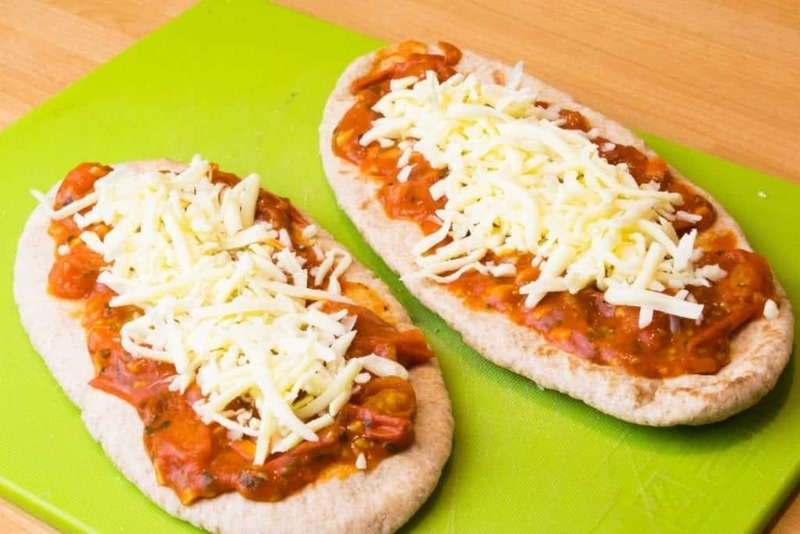 Not only is this pitta pizza recipe the perfect healthy ‘Fakeaway’ (homemade healthy takeaway) recipe, it’s also ideal for meal prepping your lunches. Simply whip it up the night before and reheat in the microwave when you want to eat it. 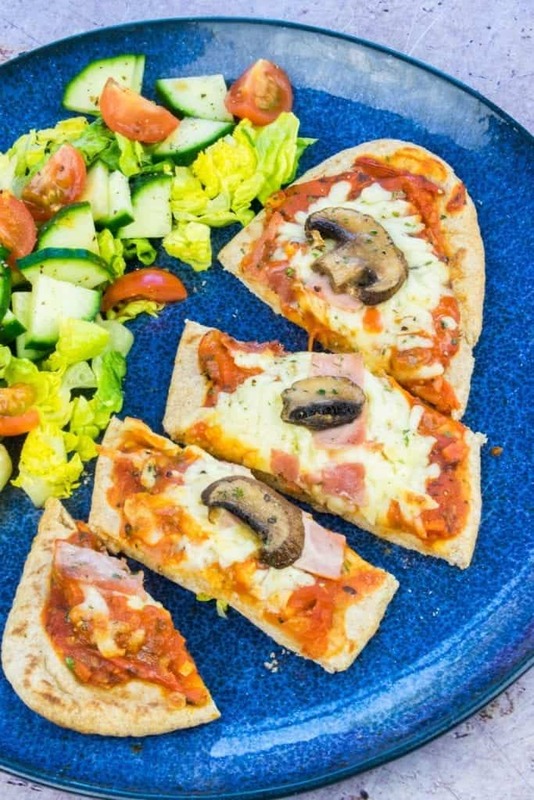 Serve with a tasty side salad, or some steamed veg if you’re enjoying it for dinner, to make this Ham & Mushroom Pitta Pizza a fully balanced and even more nutritious choice. The pitta bread itself is a great source of fibre and the tomato sauce and toppings offer plenty of healthy veggies, but a good side salad brings any dish together. This is a super simple recipe and takes just 20 minutes (or less) to whip up. The recipe serves two, although if you’re cooking for one you simply need to halve the amount of tomato sauce you make! 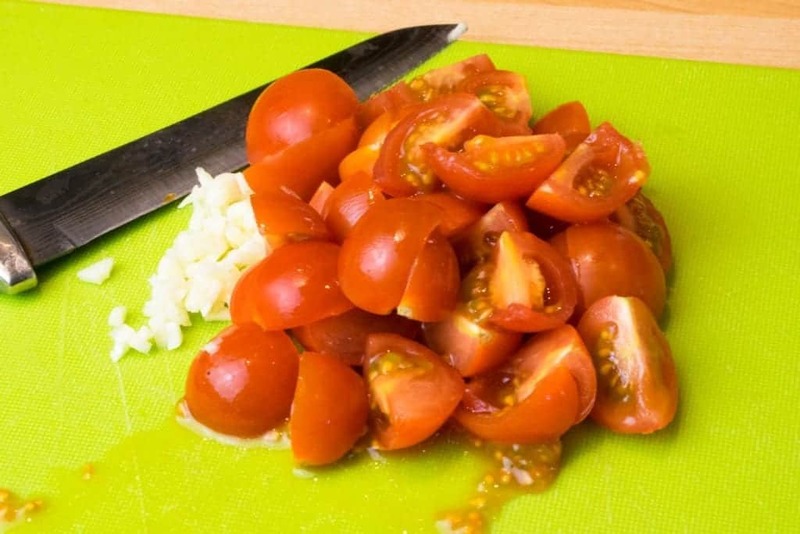 Slice up your cherry tomatoes and a garlic clove. Spray a saucepan with low calorie cooking spray and add your cherry tomatoes and garlic, along with half a tablespoon of parsley, one teaspoon of vegetable stock powder and a quarter of cup of water. Season with salt and pepper and simmer until you have a thick sauce. Top two wholemeal pitta bread with half of the sauce each and spread it evenly, leaving a gap around the edge. Leaving a gap helps make this more like a traditional pizza, as the edge of the pitta crisps up giving you a great crust! Top your pitta pizzas with your Healthy Extra A portion of grated mozzarella cheese. Again I would recommend leaving a gap between the edge of the cheese and the edge of the sauce. Doing so allows the cheese to melt without spilling over the edge of the pitta pizza and gives you a thicker cheese topping. Top your pizza with chopped ham and a few slices of mushroom on each. Season with salt, pepper and dried parsley. 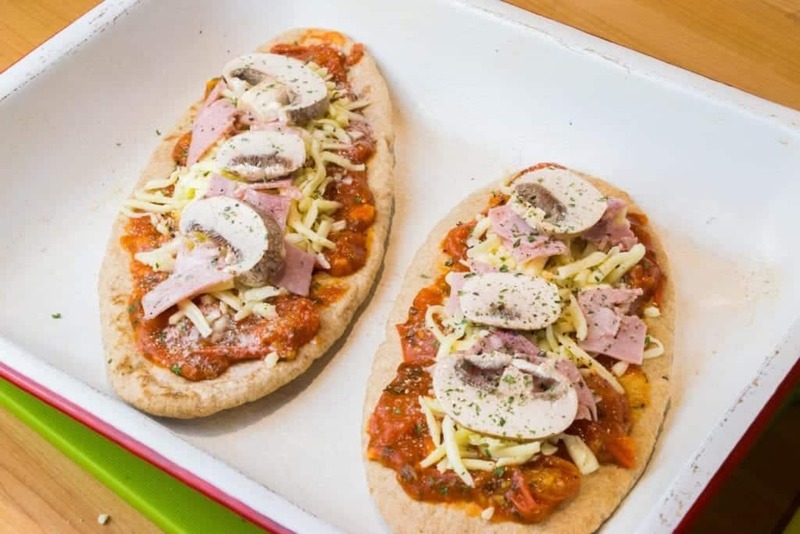 Spray each pitta pizza with low calorie cooking spray and bake in the oven at 180 degrees for 8 minutes, or until the mushrooms are cooked and the cheese is fully melted. Love This? 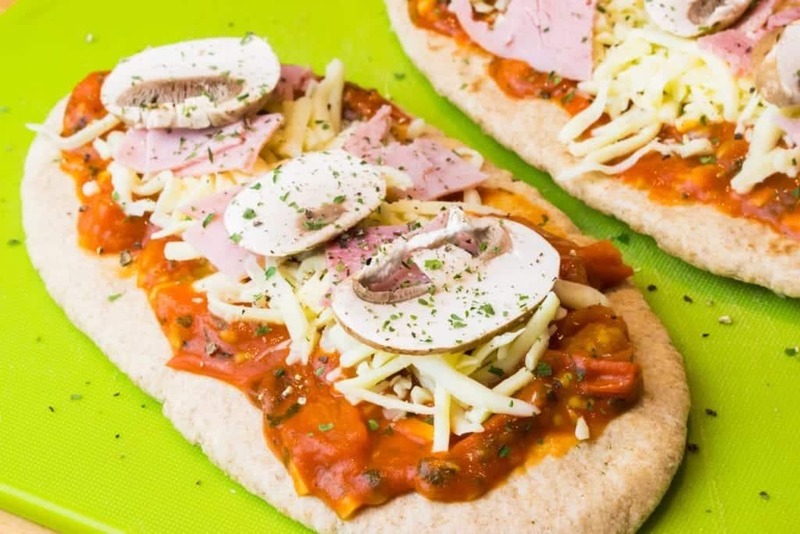 You’ll LOVE these other Slimming World Pizza Recipes! As you can see, this recipe is super simple and packed with flavour. 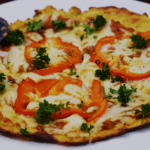 Not only is it a great choice when you’re making Slimming World pizza but it’s something the whole family can enjoy together. It’ll easily replace your unhealthy pizza night with a nutritious alternative that not only saves you calories and about a tonne of saturated fat, but will also save you loads of money in the long run! 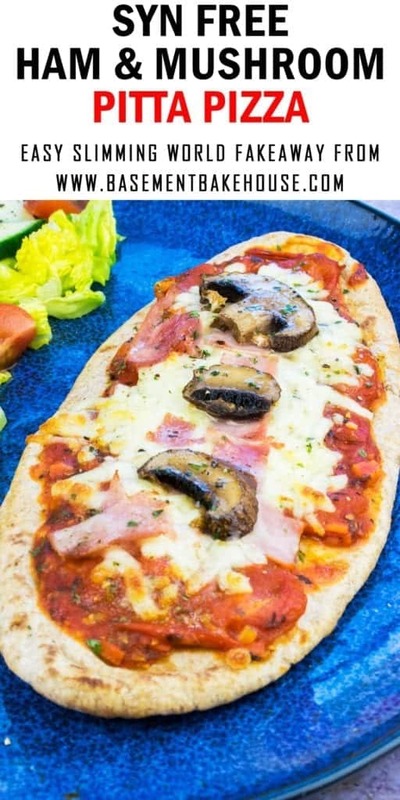 A super simple, healthy and Slimming World friendly Syn Free Pitta Pizza recipe, topped with ham and mushrooms. 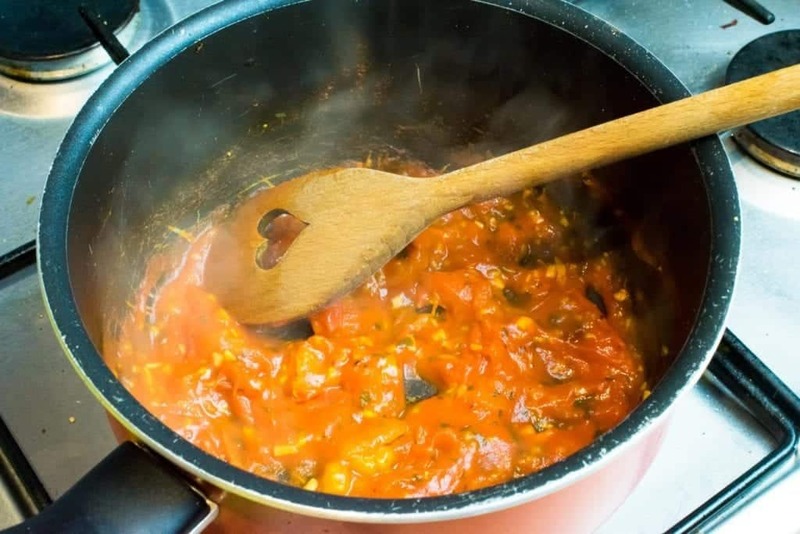 Add your sliced cherry tomatoes to a sauce pan with the garlic, parsley, tomato puree, vegetable stock powder and water. Season with salt and pepper and simmer until you have a thick sauce. Remove from the heat. Top two wholemeal pitta bread with half of the sauce each. Spread evenly, leaving a gap at the edge of each pitta. Add 40g of the grated mozzarella to each pitta pizza, leaving space between the edge of the sauce and the edge of the cheese to allow for melting space. Add chopped ham and a few mushroom slices to each pizza. Season with salt, pepper and dried parsley. Spray with low calorie spray and bake for 8 minutes, or until the cheese has melted and the mushrooms are cooked. Syn free using one Healthy Extra choice and your Healthy Extra B choice for the day. Please do not screenshot this recipe - share the link instead as syn values may change in the future. I am not affiliated with Slimming World in any way and am not a trained Slimming World consultant. 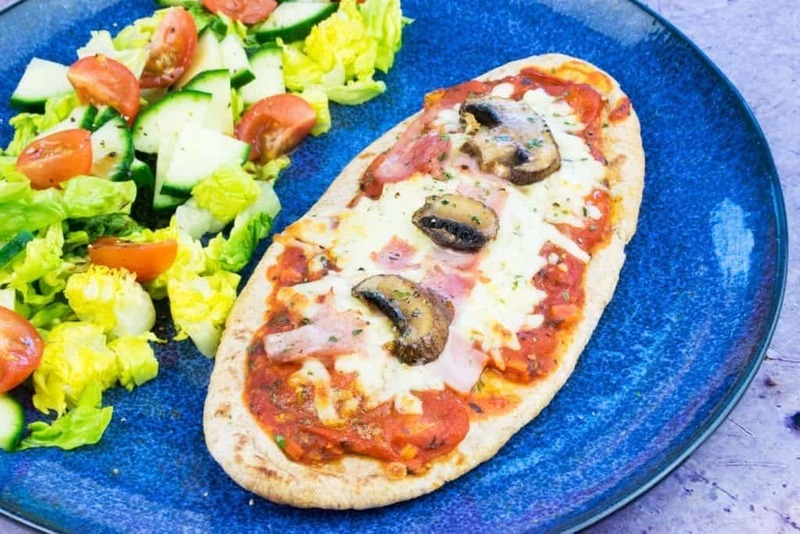 DON’T FORGET TO PIN THIS SYN FREE HAM & MUSHROOM PITTA PIZZA RECIPE FOR LATER! This is the perfect size portion for one person and my kids would love. And the perfect way to stay on the healthy path for the new year. Delicious! What a great way to get your pizza fix. Love the pita option and that homemade sauce! Yum. Pita makes a great easy base for a pizza - I can imagine it's great for when you need a quick meal or snack. That looks like a delicious pizza that is healthier! 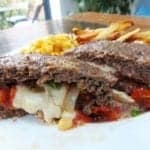 I love to use pita for a base for sandwiches and pizzas! I love the mushroom and ham topping too! This is so easy! It's the perfect lunch! I added some sliced jalapeno peppers, too, just for a bit of kick. Loved it. Got to love that chilli kick!